How and why do bees pollinate plants? Why do bees swarm? Why are there different kinds of honey? 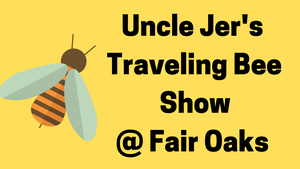 Come to Fair Oaks for Uncle Jer's Traveling Bee Show and see a segment of a real bee hive, learn about the lives of bees, receive honey samples, and get answers to all your bee questions!